In April 1862 General Ulysses S. Grant's army was encamped along the Tennessee River just north of the Mississippi border; poised to strike a blow into the heartland of the South. Grant had been at this location for about a month, awaiting the arrival of additional troops under General Buell before he began his march southward. Twenty miles to the south, in Corinth, Mississippi, Confederate General Albert Sidney Johnston ordered his troops northward with the plan of attacking Grant before Buell arrived. The stage was set for one of the Civil War's bloodiest battles. On the morning of April 6, Johnston's force surprised Grant in an attack that slowly pushed the Union troops back from the high ground they occupied towards the Tennessee River. Fighting was fierce. Many of the Union troops fled to the rear upon the initial Confederate assault and by afternoon General Johnston was confident that victory was within his grasp. However, Union resistance stiffened. Fighting around the white-washed Shiloh Church was particularly vicious. 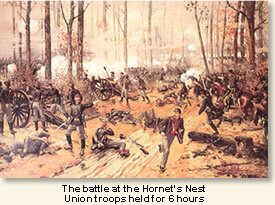 In a wooded thicket the Confederates labeled "the Hornets' Nest" the Northern troops struggled for nearly six hours before finally surrendering. The Union soldiers stalled the Confederate onslaught by exchanging their precious lives for time in which reinforcements could arrive. With nightfall, fighting subsided. Grant's forces were pinned against the Tennessee River but the exhausted Confederates were short of their goal of complete victory. One casualty of the afternoon's combat was General Johnston who lost his life while directing his troops from the front lines. His death severely affected the Confederate's morale and their belief in victory. Buell's reinforcements finally arrived during the night as did forces under General William H. Wallace, strengthening the Union lines with 22,500 fresh troops. With the break of dawn, Grant attacked, pushing the exhausted Confederates steadily back until they finally began a retreat in the early afternoon that left the field to the Union forces. The confrontation had been a slaughter on both sides. Corpses littered areas of the battlefield to the extent that, as General Grant described, "it would have been possible to walk across the clearing in any direction stepping on dead bodies without a foot touching the ground." Nearly 100,000 troops had faced each other and almost 24,000 ended as casualties. This horrendous outcome was a wake-up call to the nation announcing that the continuing war would be costly for both sides. "Day broke with every promise of a fine day. Next to me, on my right, was a boy of seventeen, Henry Parker. I remember it because, while we stood-at-ease, he drew my attention to some violets at his feet, and said, 'It would be a good idea put a few into my cap. Perhaps the Yanks won't shoot me if they see me wearing such flowers, for they are a sign of peace.' 'Capital,' said I, 'I will do the same.' We plucked a bunch, and arranged the violets in our caps. The men in the ranks laughed at our proceedings, and had not the enemy been so near, their merry mood might have been communicated to the army. We loaded our muskets, and arranged our cartridge pouches ready for use. Our weapons were the obsolete flintlocks and the ammunition was rolled in cartridge-paper, which contained powder, a round ball, and three buckshot. When we loaded we had to tear the paper with our teeth, empty a little powder into the pan, lock it, empty the rest of the powder into the barrel, press paper and ball into the muzzle, and ram home. Then the Orderly-sergeant called the roll, and we knew that the Dixie Greys were present to a man. Soon after, there was a commotion, and we dressed up smartly. A young Aide galloped along our front, gave some instructions to the Brigadier Hindman, who confided the same to his Colonels, and presently we swayed forward in line, with shouldered arms. Newton Story, big, broad, and straight, bore our company-banner of gay silk, at which the ladies of our neighbourhood had laboured. As we tramped solemnly and silently through the thin forest, and over its grass, still in its withered and wintry hue, I noticed that the sun was not far from appearing, that our regiment was keeping its formation admirably, that the woods would have been a grand place for a picnic; and I thought it strange that a Sunday should have been chosen to disturb the holy calm of those woods. Before we had gone five hundred paces, our serenity was disturbed by some desultory firing in front. It was then a quarter-past five. 'They are at it already,' we whispered to each other. 'Stand by, gentlemen,' - for we were all gentlemen volunteers at this time, - said our Captain, L. G. Smith. Our steps became unconsciously brisker, and alertness was noticeable in everybody. The firing continued at intervals deliberate and scattered, as at target-practice. We drew nearer to the firing, and soon a sharper rattling of musketry was heard. 'That is the enemy waking up,' we said. Within a few minutes, there was another explosive burst of musketry, the air was pierced by many missiles, which hummed and pinged sharply by our ears, pattered through the tree-tops and brought twigs and leaves down on us. 'Those are bullets,' Henry whispered with awe." "After a steady exchange of musketry, which lasted some time, we heard the order: 'Fix Bayonets! On the double-quick!' in tones that thrilled us. There was a simultaneous bound forward, each soul doing his best for the emergency. The Federals appeared inclined to await us; but, at this juncture, our men raised a yell, thousands responded to it, and burst out into the wildest yelling it has ever been my lot to hear. It drove all sanity and order from among us. It served the double purpose of relieving pent-up feelings, and transmitting encouragement along the attacking line. I rejoiced in the shouting like the rest. It reminded me that there were about four hundred companies like the Dixie Greys, who shared our feelings. Most of us, engrossed with the musket-work, had forgotten the fact; but the wave after wave of human voices, louder than all other battle-sounds together, penetrated to every sense, and stimulated our energies to the utmost. 'They fly!' was echoed from lip to lip. It accelerated our pace, and filled us with a noble rage. Then I knew what the Berserker passion was! It deluged us with rapture, and transfigured each Southerner into an exulting victor. At such a moment, nothing could have halted us. Those savage yells, and the sight of thousands of racing figures coming towards them, discomfited the blue-coats; and when we arrived upon the place where they had stood, they had vanished. Then we caught sight of their beautiful array of tents, before which they had made their stand, after being roused from their Sunday-morning sleep, and huddled into line, at hearing their pickets challenge our skirmishers. The half-dressed dead and wounded showed what a surprise our attack had been. " "After being exposed for a few seconds to this fearful downpour, we heard the order to 'Lie down, men, and continue your firing!' Before me was a prostrate tree, about fifteen inches in diameter, with a narrow strip of light between it and the ground. Behind this shelter a dozen of us flung ourselves. The security it appeared to offer restored me to my individuality. We could fight, and think, and observe, better than out in the open. But it was a terrible period! How the cannon bellowed, and their shells plunged and bounded, and flew with screeching hisses over us! Their sharp rending explosions and hurtling fragments made us shrink and cower, despite our utmost efforts to be cool and collected. I marveled, as I heard the unintermitting patter, snip, thud, and hum of the bullets, how anyone could live under this raining death. I could hear the balls beating a merciless tattoo on the outer surface of the log, pinging vivaciously as they flew off at a tangent from it, and thudding into something or other, at the rate of a hundred a second. One, here and there, found its way under the log, and buried itself in a comrade's body. One man raised his chest, as if to yawn, and jostled me. I turned to him, and saw that a bullet had gored his whole face, and penetrated into his chest. Another ball struck a man a deadly rap on the head, and he turned on his back and showed his ghastly white face to the sky. 'It is getting too warm, boys!' cried a soldier, and he uttered a vehement curse upon keeping soldiers hugging the ground until every ounce of courage was chilled. He lifted his head a little too high, and a bullet skimmed over the top of the log and hit him fairly in the centre of his forehead, and he fell heavily on his face. But his thought had been instantaneously general; and the officers, with one voice, ordered the charge; and cries of 'Forward, forward!' raised us, as with a spring, to our feet, and changed the complexion of our feelings. The pulse of action beat feverishly once more; and, though overhead was crowded with peril, we were unable to give it so much attention as when we lay stretched on the ground. Just as we bent our bodies for the onset, a boy's voice cried out, 'Oh, stop, please stop a bit, I have been hurt, and can't move!' I turned to look, and saw Henry Parker, standing on one leg, and dolefully regarding his smashed foot. In another second, we were striding impetuously towards the enemy, vigorously plying our muskets, stopping only to prime the pan and ram the load down, when, with a spring or two, we would fetch up with the front, aim, and fire. It was all very encouraging, for the yelling and shouting were taken up by thousands. 'Forward, forward; don't give them breathing time!' was cried. We instinctively obeyed, and soon came in clear view of the blue-coats, who were scornfully unconcerned at first; but, seeing the leaping tide of men coming on at a tremendous pace, their front dissolved, and they fled in double-quick retreat. Again we felt the 'glorious joy of heroes.' It carried us on exultantly, rejoicing in the spirit which recognises nothing but the prey. We were no longer an army of soldiers, but so many school-boys racing; in which length of legs, wind, and condition tell. " "At daylight, I fell in with my Company, but there were only about fifty of the Dixies present. Almost immediately after, symptoms of the coming battle were manifest. Regiments were hurried into line, but, even to my inexperienced eyes, the troops were in ill-condition for repeating the efforts of Sunday. However, in brief time, in consequence of our pickets being driven in on us, we were moved forward in skirmishing order. With my musket on the trail I found myself in active motion, more active than otherwise I would have been, perhaps, because Captain Smith had said, 'Now, Mr. Stanley, if you please, step briskly forward!' This singling-out of me wounded my amour-propre, and sent me forward like a rocket. In a short time, we met our opponents in the same formation as ourselves, and advancing most resolutely. We threw ourselves behind such trees as were near us, fired, loaded, and darted forward to another shelter. Presently, I found myself in an open, grassy space, with no convenient tree or stump near; but, seeing a shallow hollow some twenty paces ahead, I made a dash for it, and plied my musket with haste. Half a dozen of the enemy were covering me at the same instant, and I dropped my weapon, incontinently. Two men sprang at my collar, and marched me, unresisting, into the ranks of the terrible Yankees. I was a prisoner!" Stanley's account appears in - Stanley, Henry M., The Autobiography of Henry M. Stanley (1909); Foote, Shelby, The Civil War vol. I (1986). 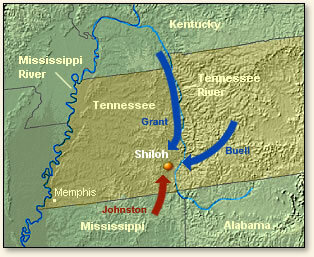 "The Battle of Shiloh, 1862" EyeWitness to History, www.eyewitnesstohistory.com (2004). The battle's name, Shiloh, came from the name of a small, whitewashed church around which much of the early fighting took place. Shiloh means "place of peace" in Hebrew.